Good Morning and Happy Monday! I hope everyone had a fantastic weekend....I'm enjoying an extra day off from school duty although I do have a class today. Fun, fun!!! This card was for a color challenge to use tempting turquoise, gable green and kraft. These colors freaked me out but as I got the layout together, I threw in a bit of black and was quite pleased with the final result. Don't you just love a challenge that makes you step outside your comfort zone?!! Well, I'm off to start my day and get ready for my girls to show up. Thanks so much for stopping by and have a great rest of the day!! WOW! Nice job outside your comfort zone...you really made this color challenge work! This is gorgeous! I never would have put those colors together either but that black really pops it! Great job! Enjoy the day with your girls! So pretty! You presented the colors beautifully and I like the added black richness! This is gorgeous! Tempting turquoise is one of my favorite colors but it has been neglected! Love the touches of black you added! Great color combo, and I love this blue flower. Great card. Oh this is superbly colorful and beautiful, Jackie! Such a wonderful color combo I may have to CASE this :) So lovely! And Bianca is such a beautiful girl - an amazing smile, just like her momma! TFS! Great colors and I love the flower. I haven't seen that stamp before. Thanks for the inspiration. This really is a great color combo. I don't usually use the bold brights but they look so good when toned down with the kraft. Wow, I *love* this color combo, very striking with the black! I just love those colors together and may have to write that one down. Lovely card. beautiful! i love the layout. Jackie, this is sooooooo pretty! I love what you did on this challenge! This color combo is amazing! Lovely work! 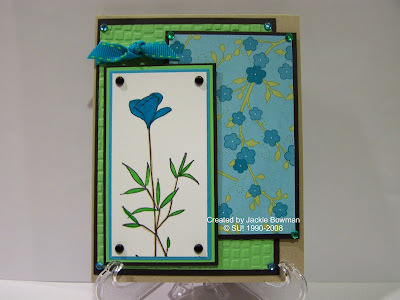 This is beautiful, Jackie...I love the color combo and the flower image is gorgeous!!! Love your awesome layout and layers, too!! !